The Dubai police force has made big news over the past month with new supercar service vehicles and the Chevrolet Camaro SS is among the latest group of new police cars – bringing a touch of American muscle to the police department of one of the richest countries on the planet. The Chevrolet Camaro SS is the newest addition to the Dubai police force which began buying high profile sports cars back in early April with the purchase of a Lamborghini Aventador LP700-4. The country received so much press coverage and positive feedback after they purchased the Lamborghini that they decided to continue adding more high profile, high performance vehicles from around the world. At first, the Dubai officials stuck to six figure supercars like the Aventador and the Ferrari FF but the Camaro SS brings 426 horsepower of affordable American muscle to the Dubai police. Interestinglyy, it should be noted that the new Dubai special service Camaro is a 2013 model year vehicle and not a refreshed 2014 model year vehicle. 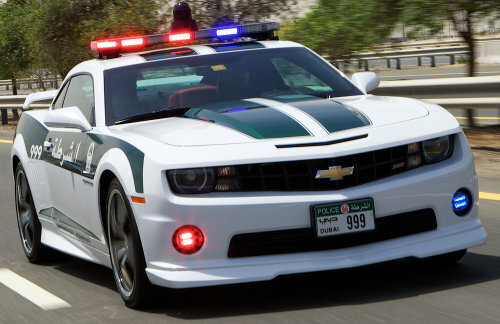 Considering how many high performance vehicles Dubai has purchased for their police department, it is kind of surprising that they did not opt for the higher performance Chevy Camaro ZL1. GM has been working to market the Camaro as a global performance car so ahead of the global debut of the refreshed 2014 Camaro, perhaps GM was looking to get another 15 seconds of fame for the end of the current Camaro. If nothing else, the arrival of the Camaro SS to the Dubai police fleet gives Camaro enthusiasts one more bit of bragging rights over the Ford Mustang fans as being considered for the Dubai police force puts the Camaro among some very heavy hitters. “The Camaro is highly regarded around the world. It is the ideal car for Dubai Police as we look to upgrade our vehicles to meet the Emirate’s world renowned standards in safety and security,” said Dubai Deputy Police Chief Major General Khamis Mattar Al Mazeina. The new Chevrolet Camaro SS Dubai police car joins an incredible fleet that includes the aforementioned Ferrari FF and Lamborghini Aventador along with a newly acquired Aston Martin One-77 and a Mercedes Benz AMG SLS. There are also rumors that there will be an unspecified Bentley vehicle in the Dubai force in the near future as well. According to GulfNews.com, these high speed supercars will not be used to chase after speeding motorists – instead serving as “road security”. However, considering that Dubai is a rich man’s playground packed full of extreme supercars, any of these 200+ mile per hour supercars could be called upon to help bring a bad guy to justice. In the meantime, it seems that the Chevrolet Camaro SS police car will be used for normal patrol duty while the pricier cars are used more as show vehicles for tourists. For example, the Aston Martin One-77 is currently stationed in the Arabian Travel Market with “car show ropes” surrounding and protecting this $1,700,000 supercar. It isnt keeping the streets any safer but it is offering one more “wow” factor for those traveling to Dubai to experience one of the world’s top destinations.